Harley tries something new: lame stunt or authentic immediacy? As Lemmy revealed in his scoop Saturday, Harley-Davidson is trying to inject some excitement in its languishing Softail line by coming out with two new "S" models with the 110 ci engine previously only available as an add-on or found in CVO models that flirted with the $30,000 mark. Let's face it, though: The 110 Twin Cam engine in a Slim may be an intriguing idea, but it's not really new. You could already get one by ordering the optional engine. What ended up interesting me more than the new Slim S and Fat Boy S was Harley's approach, announcing the bikes live on Periscope. And then what distracted me even further from the original news was the stream of comments from others watching Harley's #RideAroundTheWorld virtual stunt. One person's cutting-edge technology that is immediate and unfiltered and therefore authentic and "real" is another person's jerky video with poorly scripted banter with a lot of "uhhs," with poor sound quality and badly chosen camera angles. Here's how I experienced this new breakthrough in marketing. Or wasted half an hour, depending on how you see it. The 2016 Forty-Eight gets some new styling touches, such as the cutouts on the exhaust that are echoed in the paint on the tank. Harley-Davidson photo. The #RideAroundTheWorld starts in Portland, at See-See Motor Coffee Co., where the 2016 Iron 883, Forty-Eight and Street 750 are displayed. Nothing to see here. New styling licks or minor upgrades. 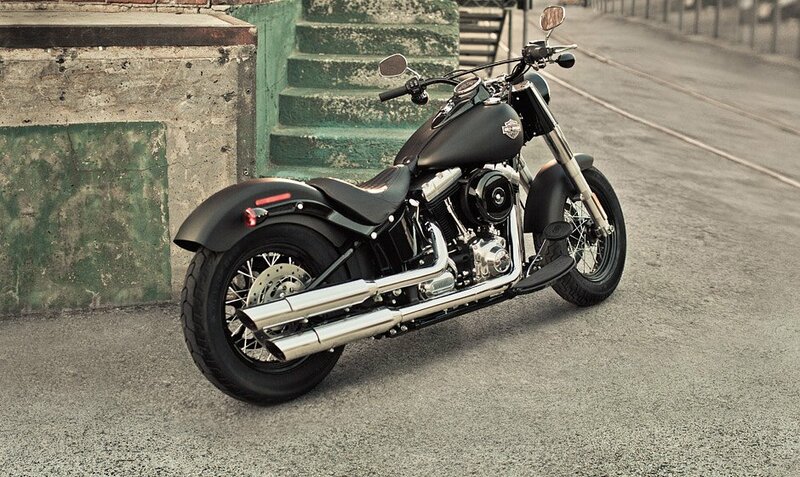 Then we finally see the Fat Boy S, and See-See owner Thor Drake rides it onto the streets of Portland. But wait! Where's the Slim? Most Periscope commenters liked the military-themed motif of the Slim S. Harley-Davidson photo. "Some people here are being rude. They don’t understand the concept here." "They need bigger license plates." "Damn, those license plates are like billboards." "No audio. I guess those Spanish bikes are super quiet." Now Mexico City. The rider is wearing jeans and a leather jacket despite the rain. He almost gets taken out by a car in the first few seconds of the ride. Commenters are starting to wander off. Or maybe they're still stuck in Barcelona or Toronto. And, we're back to Portland. And look, they're finally showing us the Slim S. Ah, so that's the bike we were seeing in Barcelona with the military motif, with a very World War II-looking white, five-point star on a green background. Most loved it. A few didn't. And that's #RideAroundTheWorld. Hey, this is not some hyper-polished Budweiser Super Bowl commercial psychologically calibrated so every precious second tugs at some deep emotion with lost puppies and horses, whether you want it to or not. This is live, unscripted, authentic, the kind of genuine communication where we might just forget, the first time around, to tell you about the most important bike we're introducing. Or maybe they should just get a good Bluetooth mic, a Steadicam and a real script. I don't know. You tell me.